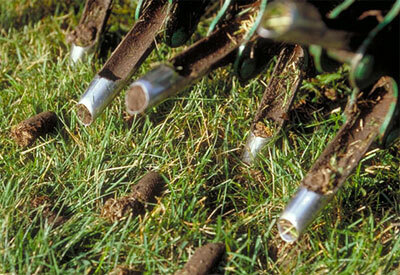 Healthy Turf — Aerate the Lawn! So you didn’t aerate the lawn last fall … and it needed it? It’s not too late in most parts of the country to aerate your organic lawn. And, if your lawn’s not organic, now’s the perfect time to begin converting it. And aerating is a big part of the change. Why aerate? Your lawn may suffer from compaction, especially if you and your family are on it a lot (and you should be… why else would you have one?). Many of the lawn problems we blame on insects, lack of water, and poor fertilizer are actually due to compaction. The more your soil is compacted, the more likely you are to have problems with thatch. When you aerate – or “aerify” as my gardening dictionary calls it – you allow more oxygen into your soil, you help prevent run-off, and you break up grass roots, further encouraging them to grow. And you do it all without harmful chemical fertilizers! The Yard Butler® Manual Lawn Core Aerator reduces compaction and thatch to let air, water and fertilizer down to the root zone. Healthy roots are essential for healthy turf. As an added benefit, the removed plugs deposit valuable microorganisms on the lawn surface. How to know if you need to aerate? Look and test. Bare spots, especially in high traffic areas, are an indication that a good aerifying is needed. Problems with thatch? Aerate after removing the thatch with a hand rake (hard work, even in small areas) or a power rake. Seeing standing pools of water in your yard is another indication. You can test your yard in different places. Wait until the soil is relatively dry – but not completely dry and hard – and test it with a garden fork or, better, a screw driver. If you can’t get that garden fork down more than an inch or two without great effort, then your soil is compacted. A screwdriver will slip easily into non-compacted soil. But it takes some bearing down to get even a sharp screwdriver into compacted soil. How to do it. 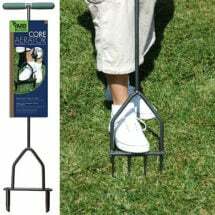 For small yards you can use your garden fork or a manual sod coring tool inserting them every few inches. For big jobs, you’ll need to rent a power lawn aerator. A good idea is to go in on the rental with a neighbor, sharing the work and other lawn care ideas (“Say, you’re not going to hire that lawn-spraying service again this year, are you? I’m not anxious to have your kids all over my lawn while waiting a few days – or for a rain – so that they can safely play in yours…”). April showers? Don’t aerify a wet yard. After aerifying. When you’re finished, your grass will be filled with the soil plugs pulled by the aerator. You can gather them up quickly by letting them dry out a day or so and then picking them up with a bagged mower (sorry, if your reel mower doesn’t do the trick… but I’m told it might). Collected soil plugs can be put into your compost heap. Don’t add compost to your yard –- a great way to keep your lawn healthy — until the plugs are gone. After aerating is a good time to re-seed and restore those winter damaged areas that the arrival of spring has revealed. It’s also a good time to adjust your soil’s pH (should be around 6.0). And there’s no need to water unless conditions absolutely demand it. April showers, right? Why do you say to remove the plugs after aerating? When reading the section on reseeding under “Lawn Rehab (practice)”, it says to leave the plugs after aerating and to compost over it. The reason was the compost would work it’s way into the holes to help rehab the topsoil. Question is… if I am rehabbing my soil and NOT reseeding shouldn’t I still follow the above advice and leave the plugs and then compost, water etc? Texture affects the perception of distance and scale.